In my high school art classes, we used whatever old brushes were available in the coffee can by the sink. Our teacher never explained to us that there were different types of brushes and that they served different purposes. Some brushes just didn't seem to work properly as I tried to paint with them. The thick plastic haired brushes were ineffective in applying watercolor paint to a surface because they could not retain the liquid pigment. The extremely soft haired brushes didn't want to move the thicker bodied paint around the canvases. I learned through trial and error what brushes to use or not to use. It wasn't until I was in college that I had a painting professor actually explain to me all the ins & outs of paint brushes. The different types of hair, cuts, sizes....this information made so much sense to me, and this knowledge allowed my painting to go to a whole new level. Each brush had a purpose. 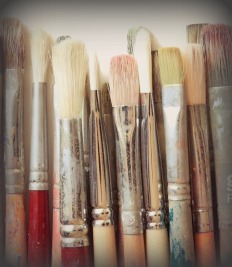 Each brush had a job that it was best at doing. I could use whatever brush I wanted, but it would not perform as it was intended. Each of us has gifts & talents that serve a specific & wonderful purpose. God wants to use these gifts and talents to glorify Him & serve others. There was a man who wanted to do whatever the pastor did at church because he respected him & wanted to be just like him. The pastor helped lead the praise team at the church. So this man joined the praise team. However, this man was tone deaf. He sang loud & wrong. It threw the rest of the singers off. They could not do what they were suppose to do because this man was doing a job that was not his to do. This also meant that the gifts and talents he had been given were not being used appropriately, and the church was not functioning as it should in the area of his true gifting. Once he realized where he could best serve....and do what he was designed to do....he felt a huge sense of relief and fulfillment. If I were to continue to use the soft haired brush to push & pull around the thicker bodied paint...the hairs would start coming out & the brush would look a hot mess! When we function outside of our gifts & talents, we find ourselves feeling unfulfilled, stressed, and at times even angry. We all have a purpose here on this earth. We need to seek out what that is & do it to the best of our ability. It doesn't matter how "big" or how "small" it is....everything works together to create this amazing work of art we call life! Dear Lord, help me to know my gifts & talents. Help me to use them to serve others & glorify You. There is nothing too big or too small that You have called us to do. In everything may I trust you as I walk forward in faith. And what a gift you have! Thanks for being willing to share it. Another great leasson. Thank you for your teachings. I relate to these each week as I am sure many others can too in thE Art World. Thank you!